As a drummer, I’m keenly aware of the effect that sound vibrations can have on a person physically and psychologically. I can physically feel the vibrations of drums resonating in my body when I play, and I have observed the psychological uplift typically experienced by people immersed in the rhythmic environments of drum circles. So when I had the opportunity to experience a special “Gong Bath,” I couldn’t resist. Conducted by Universal Sounds of Saratoga Springs, NY using a wide range of singing bowls and planetary gongs, participants are immersed in a rich vibrational soundscape. Based on the premise that all matter has a vibrational frequency, they believe this resonant gong bath will help people retune themselves to find harmony. 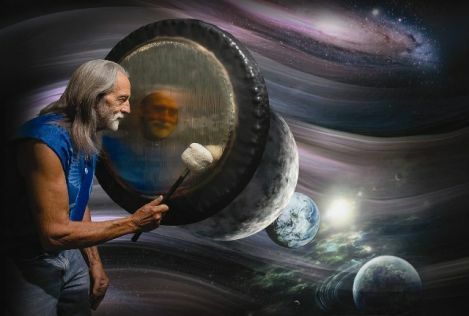 They are called Planetary Gongs because each one is tuned to the vibrational frequency of each planet, as calculated by Swiss mathematician and musicologist Hans Cousto. When played together, the air throbs with the music of the spheres. It was a beautiful spring morning. I arrived at the Hindu Temple with my yoga gear and an attitude of hopefulness. I have been managing heavy stress loads lately, and I hoped this experience would help me hit the mental and emotional “reset” button. Although I normally have a regular yoga practice to rely on in difficult times, my practice had evaporated over the past month, leaving me stiff and shaky on many levels. My meditation practice has had to double down to compensate, but my internal resources were stretched too thinly. This special event was a yoga class followed by a gong bath, and I was equally looking forward to both. The event was held in a large carpeted room with a stage running the length of the far wall. Approximately 50 people had pre-registered, but I saw many walk-ins register at the door. The room easily accommodated all of our mats without feeling too crowded. I unrolled my mat, wrapped my blanket around me, anointed my chakras with essential oils that support meditation, and settled myself in to wait for the class to begin. We began with a yoga class led by Jim Whiting, a Kripalu Yoga instructor from Body Mind Spirit Yoga in Delmar, NY. Suitable for all levels, the practice consisted of gentle stretches that left us grounded and open for what was to come. After a brief break to allow people to get settled and comfortable, the gong bath began. I was laying down with an eye bag over my eyes when the sound began, and I had an immediate experience of synesthesia where I perceived sound as color. I was quite surprised by the psychedelic light show that appeared against the inside of my eyelids as the gongs began to resonate. It was a bit like Fantasia; each time a gong was struck, a different splash of color would appear in my mind’s eye, rippling out wider as the sound of the gong spread. I was surprised by this experience simply because it seemed so unexpectedly cliché, and it happened so immediately. This synesthesia only lasted a few minutes, but I found it fascinating. But as the gongs began to overlap and the sounds became more layered, I became untethered in ways that are difficult to describe. As the gong bath began, our only instruction was to get comfortable, stay present and immerse ourselves in sound. As a seasoned meditator, “stay present” means something very specific. Our minds all have the tendency to jump around from thought to thought. We spend much of our thinking lives either dwelling on past events or thinking/planning/scheming/worrying over future events. To be focused entirely on the here and now is a meditation practice precisely because we do it so rarely we NEED to practice. For after all, life only really happens here and now. We miss the richness of many experiences because we are mentally checked out. Staying present is at the heart of Mindfulness Meditation techniques. Just about any activity can be done mindfully, with focused awareness. I’m not perfect at this, and my success varies according to my internal landscape, but I’m generally able to put aside distracting thoughts and focus on one thing attentively, especially if it’s something as lush and interesting as the rich soundscape of gongs that was making the whole room vibrate. And yet, I could not. As much as I returned my attention again and again to the sound of the gongs, as each wave of sound washed over me, I was swept away again and again. Images arose, disconnected and unfathomable. I saw a strange bearded man eating peanuts. I saw a friend in a wedding dress. I saw fragments of images that never held still long enough to identify. It was very much like a dream, yet I was very aware of and observant of this experience. Interesting visual phenomenon replaced the color splashes of the synesthesia; the images in my mind wavered and spun, brightened and dimmed, shattered and reformed. I was completely unable to bring any kind of mental discipline to the idea of staying present. I was swept away. I eventually sat up so I could hear and feel the sound of the gongs completely surround me. There was a very physical sensation associated with the vibrations. There were at least eight large gongs, and the sound was palpable. An hour flew by in what seemed like only a few minutes. Gradually the sounds tapered off, and there was silence. I have had experiences that left me feeling charged and energized, but surprisingly, this wasn’t one of them. What I mostly felt was emptied. I could clearly feel a residual sensation of vibration throughout my body, but it didn’t leave me bursting with new energy like I had expected. Instead, I tapped a pool of exhaustion I didn’t know I had in me. I went home and slept like the dead for two hours, an extremely rare event for me unless I’m ill. As I explored this after-effect, I believe this result is because the gong bath actually did what I was hoping for. I’ve been too tightly wound up for too long, and this gong bath managed to unravel that tight knot of tension. The nap was my body’s response to my spirit unknotting. It was a beautiful experience; one that I will seek out again.